Published in New Scientist (October 24, 1992, page 18). Images by Voyager 2. NASA/JPL/U.S. Geological Survey. If the solar system had not contained Jupiter and Saturn, intelligent life might never have arisen on Earth, according to a planetary scientist in the U.S. Without the two largest planets, the solar system would be full of deadly comets striking the Earth so frequently that they would impede the development of advanced life forms. 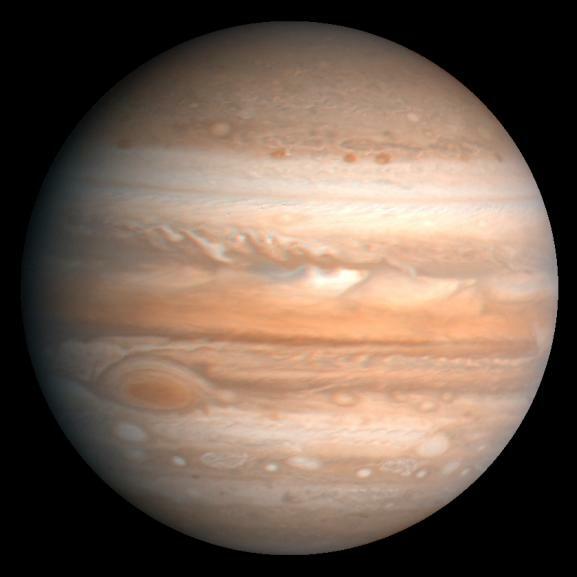 Jupiter and Saturn are gas giants, consisting of a rocky core surrounded by a thick atmosphere of hydrogen and helium. They are respectively 318 and 95 times the mass of the Earth. During the formation of the solar system, the strong gravity of the two planets was responsible for catapulting trillions of comets out of the solar system and into interstellar space. George Wetherill of the Carnegie Institution of Washington has for many years been using a computer to simulate how planets form from the disk of debris that orbits newborn stars. Last month, during a talk at the University of California at Berkeley, he presented results of simulations of a solar system in which Jupiter and Saturn had only 15 times the mass of the Earth, making them similar in size to Uranus and Neptune. Wetherill found that in such a solar system, Jupiter and Saturn ejected far fewer comets into interstellar space. Instead, over the lifetime of the solar system, the planets' gravity sent many of the comets crashing into Earth. Giant impacts occur roughly every 100 million years on the real Earth. A catastrophic collision with a large comet or asteroid 65 million years ago is thought to have caused the dinosaurs and most other species to become extinct. In Wetherill's simulations, large comets struck Earth 1,000 times as often, causing potential mass extinctions every 100,000 years. On such a hostile world, says Wetherill, advanced forms of life might not have time to evolve before a cometary collision disrupted the environment, causing their extinction. Previously, Wetherill's simulations have shown that planets resembling Earth are likely to be a natural consequence of the formation of planetary systems (New Scientist, August 10, 1991). This implies that Earthlike planets exist around many stars and provides hope that intelligent life is common elsewhere in the Galaxy. But Wetherill's new work suggests that Jupiter and Saturn are just as important. "Perhaps if it weren't for Jupiter and Saturn, we wouldn't be here," he says. Like all the planets, Jupiter and Saturn developed in the disk of dust and gas surrounding the newborn Sun. Jupiter and Saturn first formed as cores of rock and ice with about 15 times the mass of the Earth. The gravity of each core then attracted large amounts of hydrogen and helium gas in the vicinity, giving each planet an atmosphere with far more mass than the rocky core itself. But forming Jupiter and Saturn is more complicated than forming Earth, says Wetherill. "There are all sorts of ways you could mess up the formation of a Jupiter. Maybe nature just doesn't care whether it makes a Jupiter or not." One problem is that the gas in the disk of a newborn star must last long enough for the rocky core to form and then accrete it. Otherwise, the core will never grow into a planet with enough gravity to toss the deadly comets out of the planetary system. 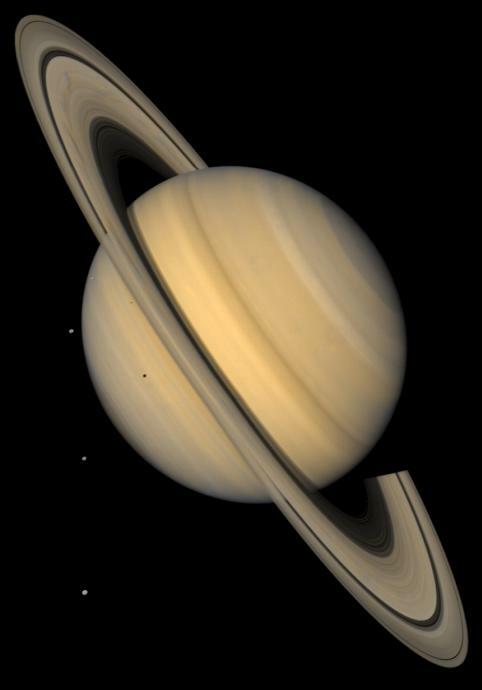 Our solar system may be unusual in having planets as big as Jupiter and Saturn. "But maybe that's not a surprise," says Wetherill. "Maybe planetary systems which don't have full-grown Jupiters never develop advanced organisms." Wetherill says that if all solar systems have huge planets like Jupiter and Saturn, then, when these planets formed, they should have tossed trillions of comets into interstellar space. So, as the Sun travels through the Galaxy, an interstellar comet should occasionally enter the solar system. Such a comet would follow a hyperbolic orbit around the Sun, in contrast with the elliptical orbit of a comet bound to the Sun. Yet no hyperbolic comet has ever been seen. "It's sort of a borderline problem," says Wetherill. "Some estimates say we should expect to have seen only one interstellar comet during the few hundred years that people have been observing comets properly. Other people say we should have observed ten. If you want to say we've just been unlucky, then that solves the matter." But Wetherill says that the lack of observed interstellar comets may instead mean that planets the size of Jupiter and Saturn do not exist around most stars, and so never eject their star's comets. "The idea that Jupiter and Saturn are essential to the development of intelligent life should be clearly labelled as speculation," says Wetherill. "But we should open our minds to possibilities of this kind. It's not pure science fiction; it has some basis in calculation." Ken Croswell earned his Ph.D. in astronomy from Harvard University and is the author of Planet Quest and Magnificent Mars.